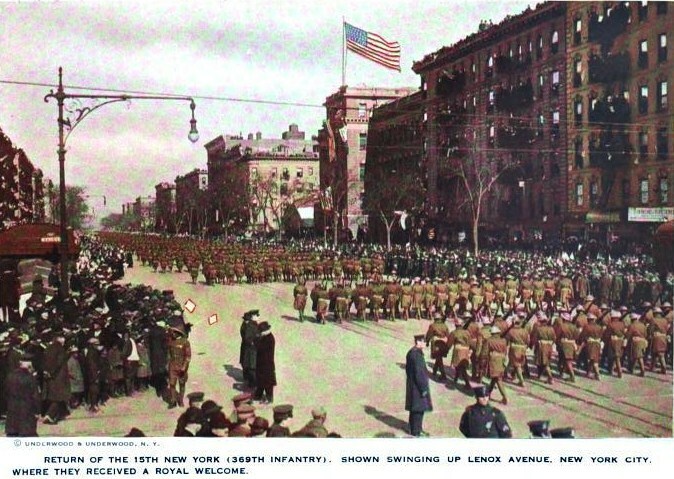 Return of the 15th New York (369th Infantry) Shown swinging up Lenox Avenue, New York City, Where they Received a Royal Welcome. No band of heroes returning from war ever were accorded such a welcome as that tendered to the homecoming 369th by the residents of New York, Manhattan Island and vicinity, irrespective of race. Being one of the picturesque incidents of the war, the like of which probably will not be repeated for many generations, if ever, it well deserves commemoration within the pages of this book. The town that’s always ready to take off its hat and give a whoop for a man who’s done something—’no matter who or what he was before,’ as the old Tommy Atkins song has it—turned itself loose yesterday in welcoming home a regiment of its own fighting sons that not only did something, hut did a whole lot in winning democracy’s war. In official records, and in the histories that youngsters will study In generations to come, this regiment will probably always be known as the 369th Infantry, U. S. A. But in the hearts of a quarter million or more who lined the streets yesterday to greet it, it was no such thing. It was the old 15th New York. And so it will be in this city’s memory, archives and in the folk lore of the descendants of the men who made up its straight, smartly stepping ranks. New York is not race-proud nor race-prejudiced. That this 369th Regiment, with the exception of its eighty-nine white officers, was composed entirely of Negroes, made no difference in the shouts and flag waving and handshakes that were bestowed upon it. New York gave its Old 15th the fullest welcome of its heart. Through scores of thousands of cheering white citizens, and then through a greater multitude of its own color, the regiment, the first actual fighting unit to parade as a unit here, marched in midday up Fifth Avenue and through Harlem, there to be almost assailed by the colored folks left behind when it went away to glory. Later it was feasted and entertained, and this time very nearly smothered with hugs and kisses by kin and friends, at the 71st Regiment Armory. Still later, perfectly behaved and perfectly ecstatic over its reception, the regiment returned to Camp Upton to await its mustering out. At the official reviewing stand at 60th street, the kinsfolk and admirers of the regimental lads began to arrive as beforehandedly as 9 o’clock. They had tickets, and their seats were reserved for them. The official committee had seen to that—and nine-tenths of the yellow wooden benches were properly held for those good Americans of New York whom birth by chance had made dark-skinned instead of fair. BUT this was their Day of Days, and they had determined (using their own accentuation) to BE there and to be there EARLY. The first-comers plodded across 59th Street from the San Juan Hill district, and it was fine to see them. There seemed to be a little military swank even to the youngsters, as platoons of them stepped along with faces that had been scrubbed until they shone. Had a woman a bit of fur, she wore it. Had a man a top hat—origin or vintage-date immaterial—he displayed that. All heads were up, high; eyes alight . Beaming smiles everywhere. No not quite everywhere. Occasionally there was to be seen on a left sleeve a black band with a gold star, which told the world that one of the Old 15th would never see the region west of Columbus Circle, because he had closed his eyes in France. And the faces of the wearers of these were unlaughing, but they held themselves just as proudly as the rest. Few of the welcomed went flagless. No matter whether a man or woman wore a jewel or a pair of patent leather boots as a sign of “class,” or tramped afoot to the stand or arrived in a limousine, nearly every dark hand held the nation’s emblem. Nearly every one wore white badges bearing the letters: “Welcome, Fighting 15th,” or had pennants upon which stood out the regimental insignia—a coiled rattlesnake of white on a black field. Those colored folk who could afford it journeyed to the stand in closed automobiles. Gorgeously gowned women alighted with great dignity beneath the admiring gaze of their humbler brethren. Taxles brought up those whose fortunes, perhaps, were not of such amplitude. Hansoms and hacks conveyed still others, and one party came in a plumber’s wagon, its women members all bundled up in shawls and blankets against the cold, but grinning delightedly as the whole stand applauded. Children by the thousands lined the east side of the avenue—Boy Scouts and uniformed kids and little girls with their school books under their arms, and they sang to the great delight of the crowd. Just why it was that when Governor Smith and former Governor Whitman and Acting Mayor Moran and the other reviewers appeared behind a cavalcade of mounted policemen, the youngsters struck up that army classic, “Oh, How I Hate to Get Up in the Morning,” no one could tell, but It gave the reviewers and the crowd a laugh. With the state and city officials were the members of the Board of Aldermen, the Board of Estimate, Major Gen. Thomas J. Barry, Vice Admiral Albert Gleaves, Secretary of State, Francis Hugo; Rodman Wannamaker and—in a green hat and big fur coat—William Randolph Hearst. Secretary Baker of the War Department was unable to attend, but he did the next best thing and sent his colored assistant, Emmett J. Scott. The reviewers arrived at 11:30 and had a good long wait, for at that time the paraders had not yet left 23rd Street. But what with the singing, and the general atmosphere of joyousness about the stand, there was enough to occupy everyone’s time. It was 11:26 when the old 15th stepped away from 23rd Street and Fifth Avenue. They looked the part of the fighting men they were. At an exact angle over their right shoulders were their long-bayonetted rifles. Around their waists were belts of cartridges. On their heads were their ‘tin hats,’ the steel helmets that saved many a life, as was attested by the dents and scars in some of them. Their eyes were straight forward and their chins, held high naturally, seemed higher than ever because of the leather straps that circled them. The fighters wore spiral puttees and their heavy hobbed hiking shoes, which caused a metallic clash as they scraped over the asphalt. At the head of the line rode four platoons of mounted police, twelve abreast, and then, afoot and alone. Col. Hayward, who organized the 15th, drilled them when they had nothing but broomsticks to drill with, fathered them and loved them, and turned them Into the fightingest military organization any man’s army could want. “The French called them ‘Hell Fighters.’ The Germans after a few mix-ups named them ‘Blutlustige Schwartzmanner’ (bloodthirsty black men.) But Col. Bill, when he speaks of them uses the words ‘those scrapping babies of mine,’ and they like that best of all. Incidentally (when out of his hearing) they refer tenderly to him as ‘Old Bill, that flghtin’ white man.’ So it’s fifty-fifty. Behind the Colonel marched his staff, Lieut. Col. W. A. Pickering, Capt. Adjutant Robert Ferguson, Major E. A. Whittemore, Regimental Sergt. Majors C. A. Connick and B. W. Cheeseman, Regimental Sergts. L. S. Payne, H. W. Dickerson and W. W. Chlsum, and Sergta. R. C. Craig, D. E. Norman and Kenneth Bellups. The Police Band was at the front of the line of march, but it was a more famous band that provided the music to which the Black Buddies stepped northward and under the Arch of Victory—the wonderful jazz organization of Lieut. Jimmie Europe, the one colored commissioned officer of the regiment. But it wasn’t jazz that started them off. It was the historic Marche du Regiment de Sambre et Meuse, which has been France’s most popular parade piece since Napoleon’s day. As rendered now it had all the crash of bugle fanfares which is its dominant feature, but an additional undercurrent of saxaphones and basses that put a new and more peppery tang into it . One hundred strong, and the proudest band of blowers and pounders that ever reeled off marching melody—Lieut. Jimmie’s boys lived fully up to their reputation. Their music was as sparkling as the sun that tempered the chill day. Four of their drums were instruments which they had captured from the enemy in Alsace, and ma-an, what a beating was imposed upon those sheepskins! ‘I’d very much admire to have them bush Germans a-watchin’ me today!’ said the drummer before the march started. The Old 15th doesn’t say ‘Boche’ when it refers to the foe it beat. ‘Bush’ is the word it uses, and it throws in ‘German’ for good measure. Twenty abreast the heroes marched through a din that never ceased. They were as soldierly a lot as this town, now used to soldierly outfits, has ever seen. They had that peculiar sort of half careless, yet wholly perfect, step that the French display. Their lines were straight, their rifles at an even angle, and they moved along with the jaunty ease and lack of stiffness which comes only to men who have hiked far and frequently. The colored folks on the official stand cut loose with a wild, swelling shriek of joy as the Police Band fell out at 60th Street and remained there to play the lads along when necessary and when—now entirely itself—the khaki-clad regiment filling the street from curb to curb, stepped by. From the stand, from the Knickerbocker Club across the street, from the nearby residences and from the curbing sounded shouts of individual greetings for the commander and his staff. But these were quickly drowned as a roar went up for Lieutenant Europe’s band, with its commander at the head—not swinging a baton like a common ordinary drum-major, but walking along with the uniform and side-arms of an officer. ‘The Salute to the 85th,’ which they learned from their comrade regiment of the French Army of General Gouraud, was what they were playing, a stirring thing full of bugle calls and drum rolls, which Europe says is the best march he ever heard. Half way down the ranks of the 2,992 paraders appeared the colors, and all hats came off with double reverence, for the Stars and Stripes and the blue regimental standard that two husky ebony lads held proudly aloft had been carried from here to France, from France to Germany and back again, and each bore the bronze token with its green and red ribbon that is called the Croix de Guerre. Keen eyes could see these little medals swinging from the silk of the flags, high toward the top of the poles. The residents of the avenue [Fifth] paid fine tribute to the dusky marchers. It seemed Inspiring, at 65th Street, to see Mrs. Vincent Astor standing in a window of her home, a great flag about her shoulders and a smaller one In her left hand, waving salutes. And Henry Frick, at an open window of his home at 73d Street, waving a flag and cheering at the top of his voice. The real height of the enthusiasm was reached when, after passing through 110th street and northward along Lenox Avenue, the heroes arrived in the real Black Belt of Harlem. This was the Home, Sweet Home for hundreds of them, the neighborhood they’d been born in and had grown up in, and from 129th Street north the windows and roofs and fire escapes of the five and six story apartment houses were filled to overflowing with their nearest and dearest. The noise drowned the melody of Lieut. Europe’s band. Flowers fell in showers from above. Men, women and children from the sidewalks overran the police and threw their arms about the paraders. At 145th Street the halt was called. Again there was a tremendous rush of men and women with outstretched arms; the military discipline had to prevail, and the soldiers were not allowed to break ranks, nor were the civilians (save the quickest of them) able to give the bugs and kisses they were overflowing with. As rapidly as possible the fighters were sent down into the subway station and loaded aboard trains which took them down to the 71st Regiment Armory at 34th Street and Fourth Avenue. Here the galleries were filled with as many dusky citizens as could find places (maybe 2,500 or 3,000) and so great was the crowd in the neighborhood that the police had to block off 34th Street almost to Fifth Avenue on the west and Third on the east.